BGSU President Hollis Moore poses with United State President Gerald Ford following his speech in Anderson Arena in September 1976. A look at the limousine and security personnel that accompanied President Gerald Ford, accompanied by Ohio's U.S. House of Representative Delbert Latta, during a campaign visit to campus in September 1976. 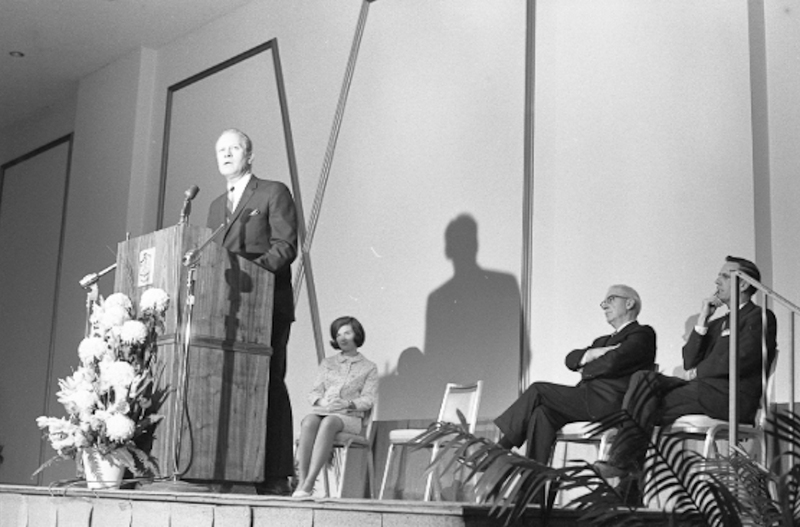 In 1966, then Speaker of the House of Representatives, Gerald Ford, was invited to speak at BGSU's Greek Week event. Anderson Arena is a full house during the 1976 campaign visit by President Gerald Ford. 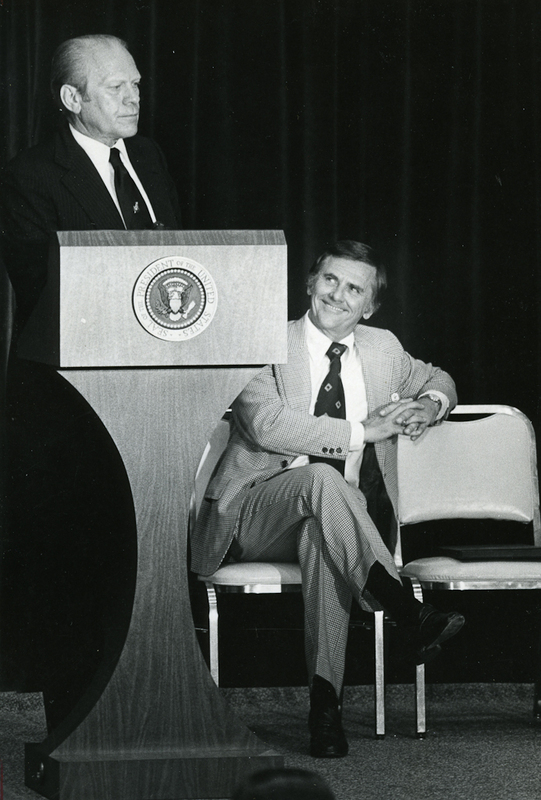 BGSU President Hollis Moore looks on as President Gerald Ford speaks at Anderson Arena in September 1976. President of the United States Gerald Ford and BGSU President Hollis Moore speak candidly prior to Ford's speech in '76. President Gerald Ford plays to the crowd during his 1976 visit to BGSU. Hollis Moore, BGSU President, stands to the left of Ford. Campus was abuzz when President Gerald Ford arrives in 1976 to give a speech on campus. BGSU President William T. Jerome speaks with then Congressman, and future U.S. President, Gerald Ford at a Greek Week Event in 1966. 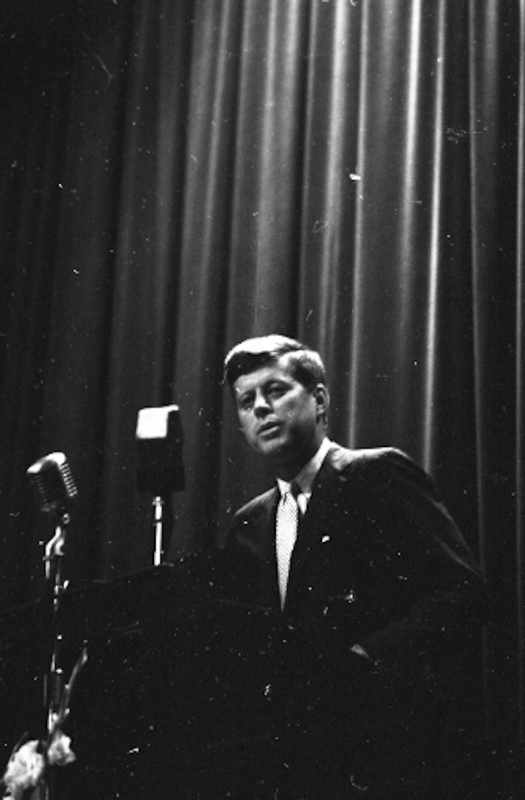 Just prior to announcing his candidacy for President, John F. Kennedy visited BGSU and spoke to students there. Future President of the United States John F. Kennedy and BGSU President Ralph McDonald. John F. Kennedy speaks with BGSU President Ralph McDonald and Vice President of the Board of Trustees Carl H. Schwyn.